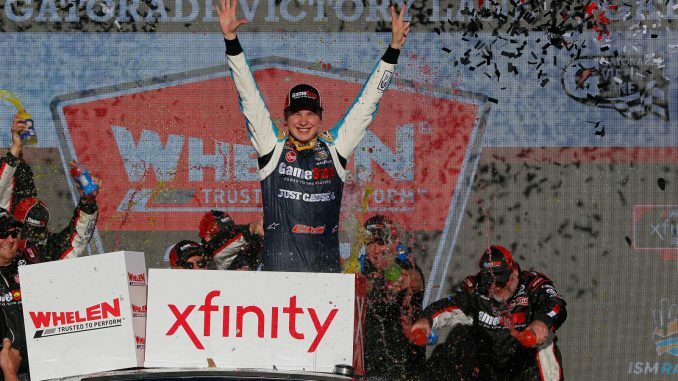 In a Playoff round that has been feast or famine for Christopher Bell, the driver of the No. 20 Joe Gibbs Racing Toyota Camry gorged to his heart’s content on Saturday at ISM Raceway. Starting from 38th, Bell roared through the field to win the Whelen Trusted To Perform 200 NASCAR Xfinity Series race and advance to the Nov. 17 season championship finale at Homestead-Miami Speedway. Faced with a must-win situation entering the Round of 8 elimination race, Bell did exactly that. By the end of Stage 1, he had cracked the top 10. At the end of Stage 2, he was fourth. And on Lap 108 of 200, he took the lead under green for the first time, forcing his way past pole winner John Hunter Nemechek for the top spot. The Sunoco Rookie of the Year contender never trailed after that, winning for the seventh time this season, the first time at Phoenix and the eighth time in his career. In a Playoff format in which victory provides redemption for a multitude of ills, Bell rallied from first-lap crashes at both Kansas and Texas to earn his spot in the final four. “I’ll be honest, after Kansas and Texas, I just kind of accepted that we weren’t going to be able to get there,” Bell said. “I just came over here with a ‘Let’s have fun attitude.’ To start in the back, we didn’t really make our way up front that fast. I kind of got stalled out once I got into the top 15. Bell joined Texas winner Cole Custer in the Championship 4 Round, along with Saturday’s runner-up Daniel Hemric and sixth-place finisher Tyler Reddick, both of whom advanced on points. Matt Tifft ran third but fell short in the Playoffs, as did regular-season champion Justin Allgaier, who won the first and second stages but sustained heavy damage to the right front of the No. 7 JR Motorsports Chevrolet when Nemechek slid sideways across the track on Lap 145 and clobbered Allgaier’s car. Allgaier later lost his brakes before finishing 24th. “It’s extremely disappointing,” said Allgaier, who lost seven spots on pit road after sliding into his stall under caution on Lap 139. “But we did everything we could in the first two stages. We had a really fast Brandt Camaro. We had a lot of trouble today, seeing our pit stall. It was really difficult to see where we were at and navigate that. I lost us some spots on pit road. Likewise, veteran Elliott Sadler left Phoenix disappointed after early contact with the No. 40 Toyota of Chad Finchum cost him track position he could never regain. Sadler finished 11th and failed to advance to Homestead in his final year as a full-time NASCAR driver. “I made too many mistakes today to give my guys an opportunity,” Sadler said. “It’s all on me. My guys work too hard and deserve to be a part of this Championship 4 at Homestead, but I just didn’t pull my part through. Austin Cindric, whose only path to the Championship 4 was to win at ISM, finished fourth. Ryan Preece and Brandon Jones were fifth and seventh, respectively, with Custer finishing eighth. Nemechek and Spencer Gallagher completed the top 10. 1. (38) Christopher Bell # (P), Toyota, 200. 2. (8) Daniel Hemric (P), Chevrolet, 200. 3. (10) Matt Tifft (P), Chevrolet, 200. 4. (3) Austin Cindric # (P), Ford, 200. 5. (5) Ryan Preece, Toyota, 200. 6. (14) Tyler Reddick # (P), Chevrolet, 200. 7. (7) Brandon Jones, Toyota, 200. 8. (2) Cole Custer (P), Ford, 200. 9. (1) John Hunter Nemechek, Chevrolet, 200. 11. (6) Elliott Sadler (P), Chevrolet, 200. 12. (12) Ryan Reed, Ford, 200. 13. (15) Ryan Truex, Chevrolet, 200. 14. (9) Shane Lee, Chevrolet, 200. 15. (23) Ross Chastain, Chevrolet, 200. 16. (13) Michael Annett, Chevrolet, 200. 17. (18) Jeremy Clements, Chevrolet, 200. 18. (39) Ty Majeski, Ford, 199. 19. (16) Ryan Sieg, Chevrolet, 199. 20. (17) Alex Labbe #, Chevrolet, 199. 21. (19) JJ Yeley, Chevrolet, 199. 22. (21) Joey Gase, Chevrolet, 199. 23. (28) BJ McLeod, Chevrolet, 199. 24. (4) Justin Allgaier (P), Chevrolet, 199. 25. (26) Donald Theetge, Chevrolet, 197. 26. (27) Garrett Smithley, Chevrolet, 197. 27. (24) David Starr, Chevrolet, 197. 28. (32) Spencer Boyd #, Chevrolet, 197. 29. (29) Quin Houff, Chevrolet, 196. 30. (34) Bayley Currey(i), Toyota, 193. 31. (31) Tyler Hill, Dodge, 185. 32. (36) Mike Harmon, Chevrolet, 181. 33. (33) Akinori Ogata, Toyota, 179. 34. (40) Josh Bilicki #, Toyota, 158. 35. (20) Tommy Joe Martins, Chevrolet, Engine, 151. 36. (37) Vinnie Miller #, Chevrolet, Ignition, 144. 37. (22) Chad Finchum #, Toyota, Rear Gear, 143. 38. (30) Stephen Leicht, Chevrolet, Suspension, 27. 39. (35) Morgan Shepherd, Chevrolet, Brakes, 22. 40. (25) Jeff Green, Chevrolet, Brakes, 18. Average Speed of Race Winner: 100.643 mph. Time of Race: 1 Hrs, 59 Mins, 14 Secs. Margin of Victory: 1.887 Seconds. Caution Flags: 6 for 34 laps. Lead Changes: 7 among 6 drivers. Lap Leaders: J. Nemechek 1-20;J. Allgaier (P) 21-48;D. Hemric (P) 49;A. Cindric # (P) 50-52;J. Allgaier (P) 53-93;C. Bell # (P) 94;J. Nemechek 95-107;C. Bell # (P) 108-200. Leaders Summary (Driver, Times Lead, Laps Led): Christopher Bell # (P) 2 times for 94 laps; Justin Allgaier (P) 2 times for 69 laps; John Hunter Nemechek 2 times for 33 laps; Austin Cindric # (P) 1 time for 3 laps; Daniel Hemric (P) 1 time for 1 lap.